A fundraising target smashed, a new personal best and a club record as Matt approaches the first weekend in April, his 6 marathons in 7 weeks challenge begins! With the Oasics Manchester Marathon on Sunday 7th April, Matt dons his PCA running vest at the start line of the 26.2 miler with 20,000 other runners. Matt crossed the finish line at the 3hrs, 6mins and 25secs mark beating his current personal best by 3 minutes and over-riding the existing club record at Riviera Racers – where Matt is proudly the Men’s Captain. During his triumph at Manchester on Sunday, Matt’s fundraising page SMASHED it’s target of £2,000! We believe this is a reflection on how determined, focussed and passionate Matt is about running. 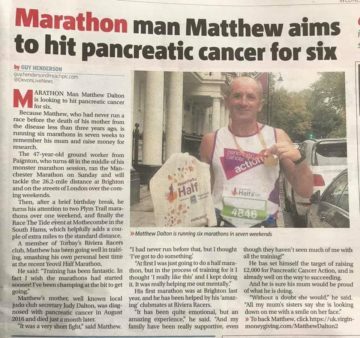 The network of support shown through his running ventures and fundraising efforts has truly touched Pancreatic Cancer Action and we consider Matt the perfect case study of turning something incredibly heart-breaking into a real positive and uplifting outcome. With only a week’s rest in between Manchester Marathon and his next endeavour at Brighton Marathon on Sunday 14th April 2019, we urge Matt to give those legs a break! We are looking forward to catching-up with Matt on the Brighton Seafront before he sets of for yet another 26.2-mile adventure. Although he hasn’t promised another personal best, watch this space – there is no stopping this man!